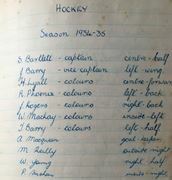 Peter Barry, nephew of our OB, the late Peter Barry, has kindly scanned a 1934/35 Hockey season notebook belonging to his father Thomas (Tom) Barry with notes about each of eight matches against Gordonstoun, Camerons, HLI and various XIs (Mr Threlfall, Mr Cundell, Mr Greenhalgh). It makes fascinating reading of a schoolboy’s perspective over eighty years ago. The notebook is 22MB in size and may take time to download.